Create a flurry of activity with this outstanding nectar plant. Butterflies, honey bees & native bees love it. Seed: Ready to germinate. The tiny seeds will need sunlight, so just sow them on the soil surface. 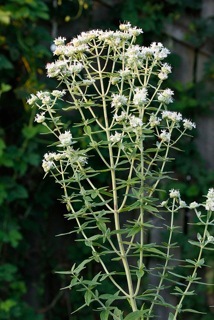 A great plant for bees and butterflies. I even saw hummingbirds visiting this one. Does well in container gardens. Q: Can I put this seed down now without going through the stratification process? A: It will likely germinate without stratification as other Pycnanthemums will often germinate without the cold-moist period. 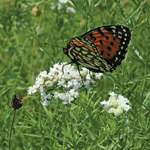 We've sown slender mountain mint seed in the past without stratifying the seed and have had good results. They usually germinate within 8 to 15 days. The tiny seeds will need light to germinate, so don't bury them. 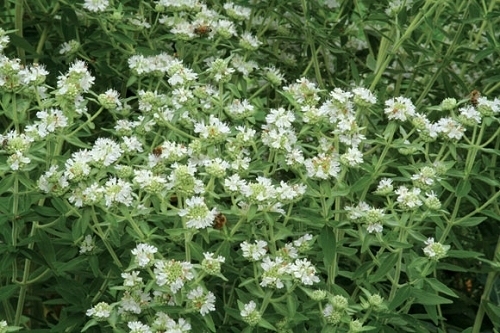 Q: What zone is this mountain mint hardy to? Thank you. A: According to the Missouri Botanical Garden, it is good in zones 4 to 8.